Located on Tanzania's northern border, Mount Kilimanjaro is Africa's highest mountain. Here, the mountainous surroundings provide a rich volcanic soil suitable for the production of quality coffee. This Tanzanian peaberry coffee has less acidity than most East African varieties with a pleasing fullness and richness. An excellent general purpose coffee. Coffee beans are the seeds from the fruit of the coffee tree. Typically, each fruit contains two seeds which face each other on their flat sides. However, a small percentage of the fruits actually contain a single, rounded seed, referred to as a peaberry. Peaberries are reputed to roast more evenly than the more common flat berries, due to their rounder shape. Although peaberry coffee beans are most commonly associated with Tanzanian coffee, they are actually present in a variety of coffees, and are becoming increasingly popular in Hawaiian Kona coffee. Tanzanian coffee is grown on the slopes of Mount Kilimanjaro. The altitude, rich volcanic soil, and optimal climate are all ideal for growing coffee. The beans are wet-processed, soaked in fermentation tanks for two to three days after the outer skin and pulp are removed. The peaberry coffee beans represent only a small percentage of Tanzania coffee; these beans are carefully selected and separated from the regular flat beans for outstanding quality and an even roast. 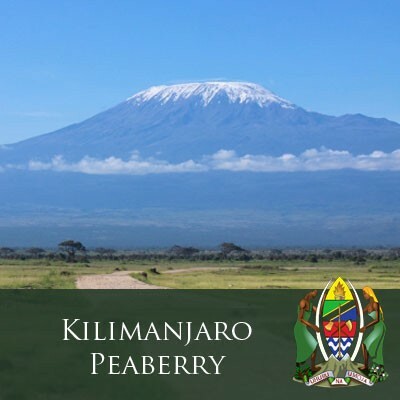 Peaberry coffee has become very popular, and as a result, some specialty coffee shops will charge a high premium for Tanzanian peaberry coffee beans without regard to the actual quality of the cup. J. Martinez & Company is, of course, committed to providing only gourmet coffees of outstanding quality, and we only sell Tanzanian peaberry coffee that meets our high standards. Our Tanzanian peaberry coffee is available in a medium roast, which we feel is best suited to the particular qualities of the coffee, such as its relatively low acidity and rich flavor. We invite you to try our Tanzanian coffee to see for yourself why more and more customers are asking for peaberry coffee beans.